Fly and mosquito season is definitely here in the Sierra Foothills where I live and ride. After an unusually wet and cool spring the flies and mosquitoes are here in full force and I am determined not to be pushed around by bugs!! I just put in a double order for fly predators and put out several stinky fly traps around the barn. I hope this isn’t a preview of the coming summer. For easy insect repellent application I use a three gallon garden tank sprayer. The type used to spray weed killer in the garden. I like a plant based, natural repellent mixed with water. Or I make up my own with the following essential oils. Add 2 tablespoons each of tea tree, geranium, rosemary, and eucalyptus. Mix with a cup of white vinegar and a dash of dish soap in a gallon of water. (You can add aloe juice if you like) Shake well with every application. I just pump the sprayer, press the trigger on the spray wand and pass it over the horse. This gives a steady, even coating with little effort. I have three horses to spray down in the mornings and it makes the process go so much quicker. 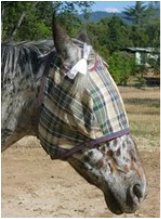 I also tie or rubber band fabric softer sheets to my horses’ manes and tails. This also works well on camping trips. I just leave them on for several days. When I am on the trail - I keep a small rag soaked with a 50/50 mixture of Avon Skin-So-Soft bath oil and alcohol in a zip lock bag. I have separate a human rag and a horsey rag. They fit easily into your saddle bag.